I was made aware by the realtor of my unit, 1210, that there is an open house of the “for sale” units of Portofino South tomorrow, Thursday the 8th, from 1-3PM. Some, if not all, realtors representing for sale units in the building are participating. So come down to the lobby during that time and meet with a realtor if you are interested in acquiring a(nother) unit. Because of the high number of units currently for sale at Portofino, the management office approved an open house. However, I don’t believe the office has posted any notice for residents. If you rent your apartment you are obligated to pay a Business Tax Rental to the city of West Palm Beach. I do not know where the condo association falls in not putting this into effect. Below are links to the two forms to fill out. Anyone renting and not paying this is in violation of Florida law. It has been a very long time since I posted anything about the building. One reason was that the comments got very ugly and mean. This time around I will not post any comments or blogs without a known name with their email address attached. That might take care of the “nasties”. Second reason was that the building was supposed to build a website but like all things in the building it did not get done in a timely manner. Maybe it is coming? And lastly why I want to reopen this blog is that owners have no where to go with problems, questions, or to get anything done. The board has internal problems and the office is very hard to motivate. I am a snow bird and not there for 6 months a year. When people such as myself are gone we never hear anything of the building. We are never called, emailed or sent any mail of meetings, changes or problems going on. My maintenance is 12 months but my service is 6 months and only when I am there. About a month ago a neighbor told me that the power went off in the building. In the past, my air conditioning , that I leave on , does not go back on by itself. So she is kind enough to go to my apartment and put the air conditioning on again. My neighbor does this for two other owners that have the same problem. I called the office to see if they knew of the outage and did someone go up to the apartments that the building has a list of that has this problem. I was very unhappy with the answer that they were not responsible. I then wrote a letter hoping that the board or the office would address this problem for some of us but a letter was received back with the same ” we are not responsible”. I then called the office and asked if they could research if there is a solution to this situation by putting in a device to the system. I was told they would get back to me. No one ever called or helped. This is real hard to fathom when you write out your maintenance check each month and this was the first thing I asked the office to do since I left in the end of April. Well I researched the issue and there is something that could be installed that would help with this situation. With 50 percent of the building gone during the summer you would think they would have time or interest to help the owners. If anyone wants to know what the solution is please email through the blog and I will tell you. So this is what this blog is all about. If you have a problem and it is not addressed please lets share and see if we can help eachother. 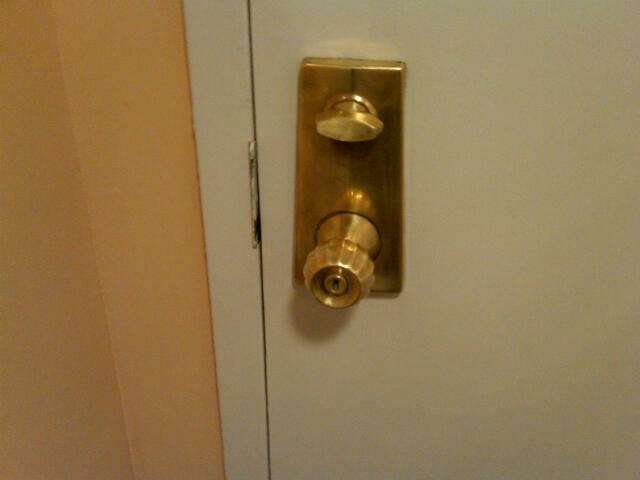 I do not know if most newcomers to the building know that our doorknobs in our apts and outside all all brass. One day I decided to polish one and after 4 hours of lots of elbow grease they look wonderful. However, since it took so much time and muscle I have decided to give them out to a professional. But please look at the difference in the pictures below. 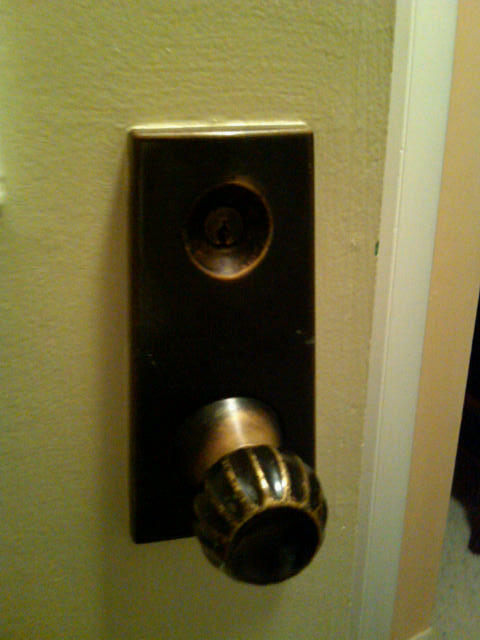 It makes such a difference and we are blessed with all brass knobs that are all original.